I love rye bread. When I was in high school, I was addicted to marbled rye. I'd eat it without anything on it, not even butter. As an adult, my husband and I buy rye bread for sandwiches once in awhile. I used to make tuna melts and Italian deli sandwiches on rye for dinner. Last October, my husband and I visited New York City for a couple days, and we still talk about the food. 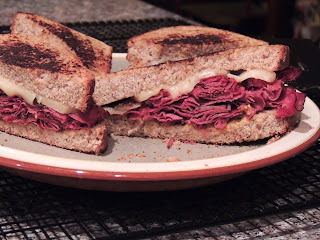 One of our favorite food memories was a pastrami and swiss on rye sandwich we shared late one night. It was from one of those all-night delis. I can really see why New Yorkers have trouble adjusting when they move to L.A. We don't have anything that comes close here, especially nowhere you can just walk to in the middle of the night and order a hot deli sandwich (at least not in my neighborhood). 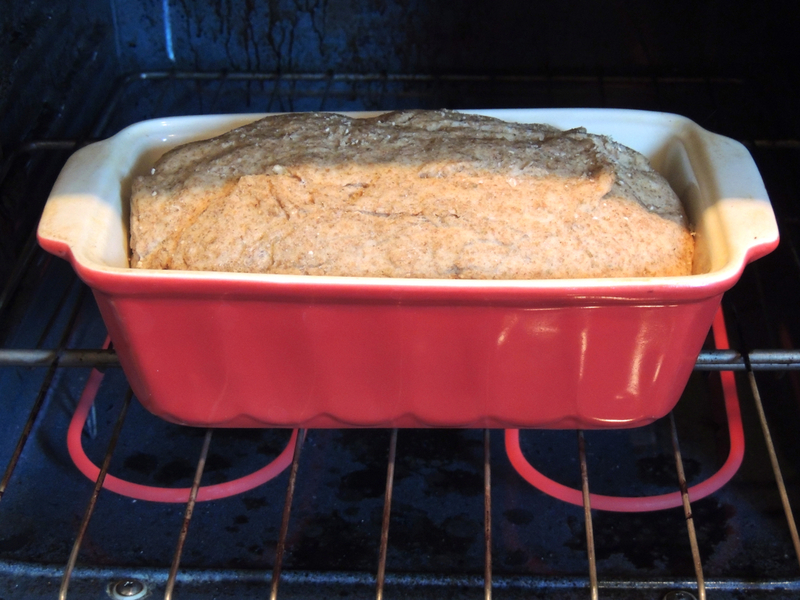 Now that I've mastered whole wheat bread, I've been looking for a rye bread recipe to try. A lot of them looked pretty complicated to me since I'm fairly new to making yeast bread. My husband sent me a couple recipes. 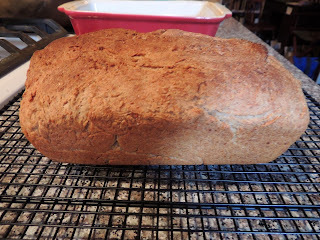 He found the recipe I used for whole wheat bread, and he was successful in finding a rye bread recipe that looked doable. He actually sent me two recipes. I chose the one that looked easier. I pretty much just followed the recipe as written, but I omitted caraway seeds. I'm sure they'd be good, but there were already so many new ingredients I needed to buy. I didn't have rye flour, milk powder, bread flour or vital wheat gluten (in fact, I'd never heard of that before). The baking aisle at the grocery store was my friend. These ingredients weren't cheap, so once they run out, I'll probably go back to buying rye bread once in awhile instead of making it myself, but we'll see how good the bread turns out before I completely rule out making it myself in the future. The recipe was pretty easy. I used vegetable oil instead of butter, and I didn't warm the honey, but since I mixed it with warm water, I assumed that would be okay. I needed it in the Kitchenaid mixer instead of by hand, and I used a trick from my whole wheat bread recipe for rising. I let it rise right in the Kitchenaid mixer bowl instead of transferring it to another bowl. Why dirty more bowls than necessary? I just put a dishcloth over the bowl and left it on the counter. I checked the dough after about 20 minutes, and it wasn't rising as much as I hoped. We keep our house at about 73 degrees, so maybe it wasn't warm enough. I took the bowl outside and set it on a table in our screened it patio. The outside temperature was in the low 80s. I let it rise about 45 minutes it order to get it to double in size. The recipe said not to punch down the dough when transferring it to the bread pan, so I tried to handle it as little as possible. 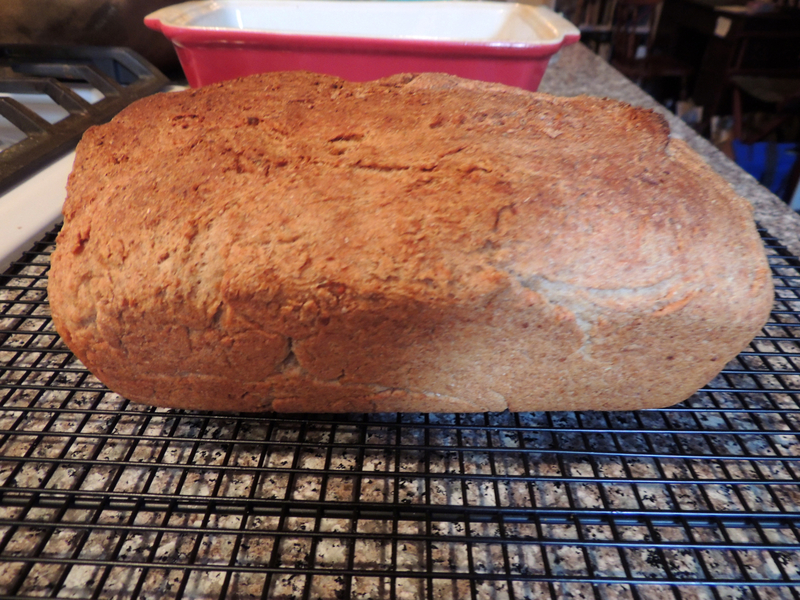 I shaped it a little so it would fit in the pan, but I didn't smooth it as much as I do when making whole wheat bread. I'm slightly worried that the final product isn't going to look as perfect as it could since I didn't smooth the dough out, but as long as it tastes good, that's all that matters. It's in the oven right now. My husband said it looks and smells good. I always love the smell of baking bread. It smells like Subway. Update: I took the bread out of the oven after letting it bake for 35 minutes, and I let it cool for about an hour. It was still warm when I cut it. My new electric bread knife had a little trouble getting through the bread. I'm not sure if it's a problem with the knife (it was the first time I'd used it) or the bread (which was very dense). My husband and I tasted an end. The consensus: It's okay, but we like my whole wheat bread better. This rye bread is very dense, takes a lot of ingredients I wouldn't otherwise have on hand, and doesn't taste as good as what I get at the grocery store. I have leftover rye flour, so I'll probably try a different rye bread recipe to use it up. 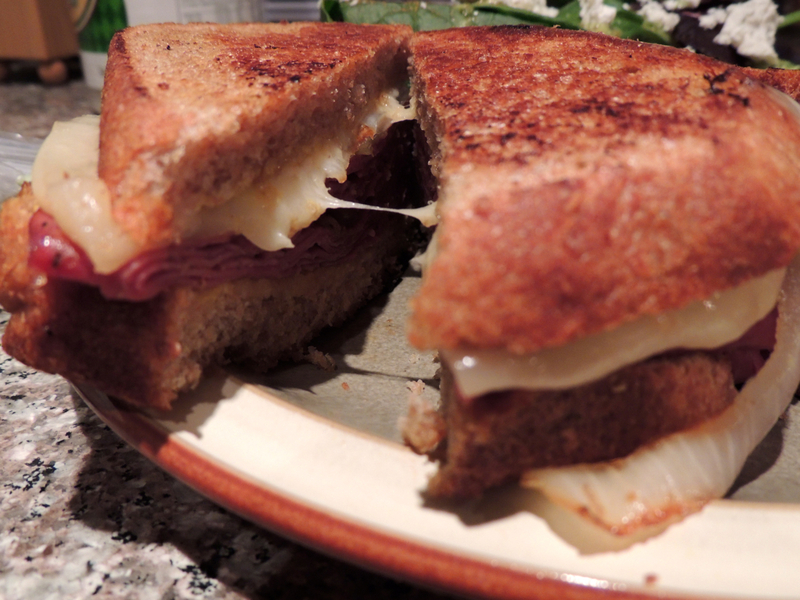 I made pastrami and swiss sandwiches on the rye bread for dinner. 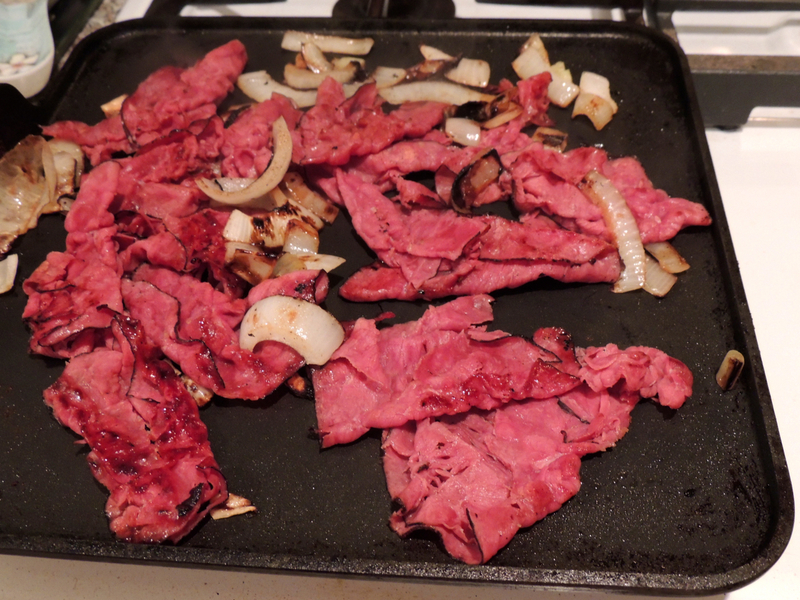 I started by grilling some onions and then added the sliced pastrami to the griddle to crisp it up. Meanwhile, I prepared the bread with spray butter on the outside (so it'll get golden brown). I used one ounce of sliced swiss cheese on each sandwich, and my husband loves mustard, so he add a little mustard. Then I piled on the pastrami and grilled onions, closed the sandwiches, and put them on the griddle for a couple minutes on each side to toast the bread and melt the cheese. The sandwiches weren't as good as the pastrami and swiss sandwich I had in New York, but they were better than the pastrami sandwiches I've had at delis in L.A. The bread makes a huge difference. I made pastrami and swiss sandwiches on my whole wheat bread a few weeks ago, and I liked those better because I like that bread better.